Happy Halloween, my crafty friends! 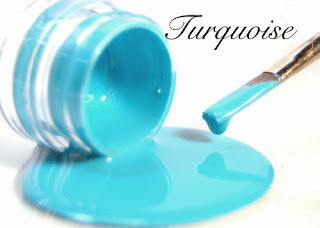 I'm picking up an extra post for the Creative Inspirations Paint blog. It is pure pleasure to have an opportunity to work with these paints a little more. And what day could be more fun to post than Halloween? 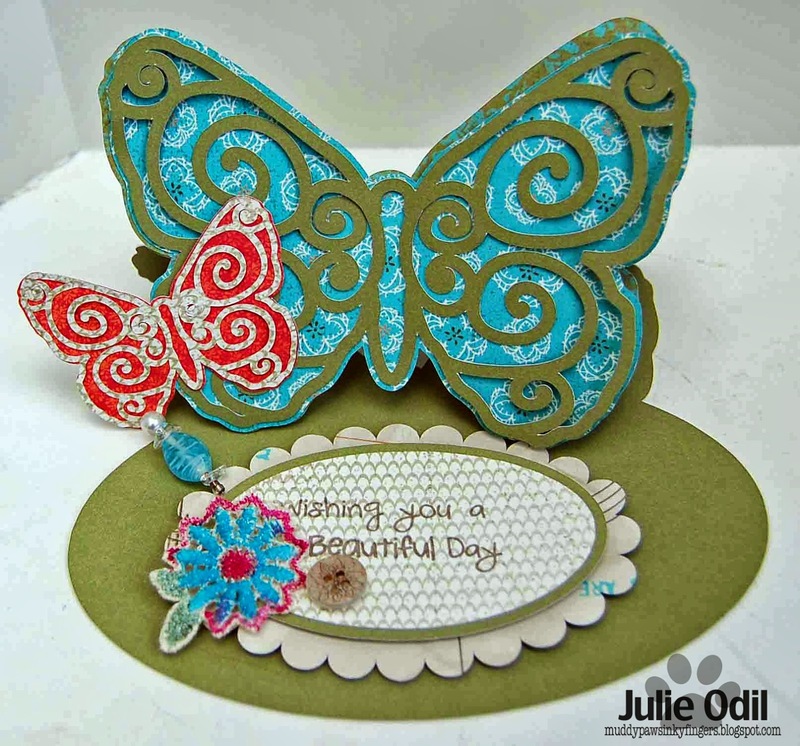 Those of you who frequent my blog and know my style know that I often make 2 similar cards using the same card base. That's what I did today. I cut one 8 1/2x11 piece of gray cardstock in half, made two card bases out of it, and built from there. So, I have two similar in design, yet quite different in appearance cards to share. 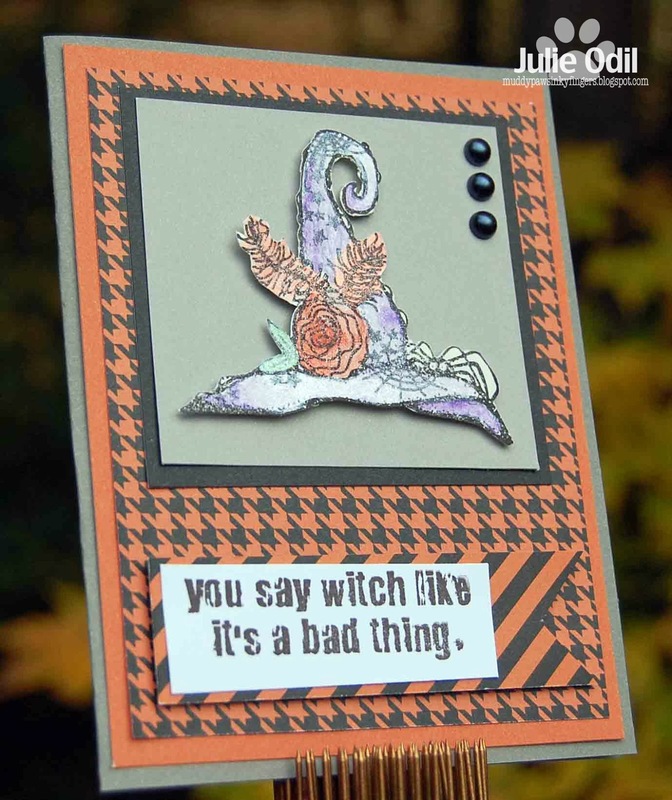 I stamped my witch hat image, then painted it with the following Creative Inspirations Paints: Pumpkin, Orange, Light Purple, Royal Purple, Evergreen, and Green Olive. I love how well the paints blend together! Can you see the shimmer on that hat? It's so pretty it spooks me! I used the same stamp for my image, the same colors of Creative Inspirations Paint (Pumpkin, Orange, Light Purple, Royal Purple, Evergreen, Green Olive), but mixed it up some, changing the look of the witch's hat. Both hats are fussy cut, then attached with foam tape for a little 3D effect. And, here's another view of the second card, again trying to photograph the incredible shimmer of Creative Inspirations Paint. 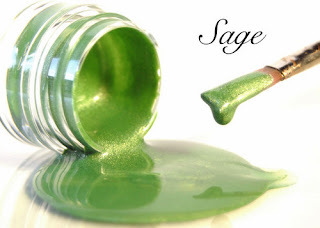 I love, love, love that shimmer! The stamp set that I used on these cards is from Unity Stamp Company. It's called "You Witch!". The papers are all from Close To My Heart. They are some retired Halloween papers from 2012. The bling is from my stash. Here are all the paints I used. So pretty. Thanks for visiting today. Have a safe, candy filled Halloween! Happy Day-Before Halloween, everyone! The current challenge on the Get Inky! Challenge blog is 3D Holiday. Being so close to Halloween, I just HAD to create a "spooky" 3D character for some inspiration! 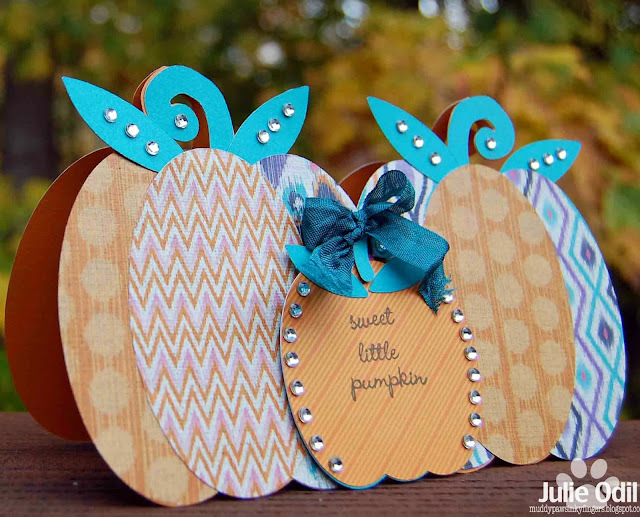 This treat bag is cut out on my Silhouette and stamped with the Get Inky! Stamps 2013 Halloween set. Isn't it adorable? Perfect for a little treat for the ghosts and goblins in your life! The treat bag is an SVG file from My Scrap Chick. I inked the cheeks with a little Tim Holtz distress ink in Spun Sugar, because every ghost looks better with rosy cheeks. The crinkle ribbon bow is from 3 Girl JAM. It is, of course, from the Spooky Bundle -- how appropriate is THAT? The eyes were made with an anthracite Viva Décor pen. That's it for today! Have a safe, fun, candy filled Halloween! Happy Monday, my crafty friends. I'm coming off a weekend of spending time with 2 good friends and their 4-legged furkids. It was great, but I'm very tired! Back to work with very little energy. This week, the Joy's Life design team is featuring projects with the theme "Around the House". I have to tell you, the first thing that came to mind for me was how much cleaning could be done around my house! Maybe if I stayed home and didn't craft all the time when I WAS home. Oh well! It just gets dusty again anyway. So, after much hemming and hawing, stumbling and bumbling, I decided I wanted to make a little something for the end table by our couch in the living room. I found a cutting file for an acorn box -- a perfect Fall decoration that I could cut out on my Silhouette -- and I went with that. I used the Joy's Life Stamp Set "It's All Fall Puns" for the sentiment on my acorn shaped box. The box is an SVG file from My Scrap Chick. 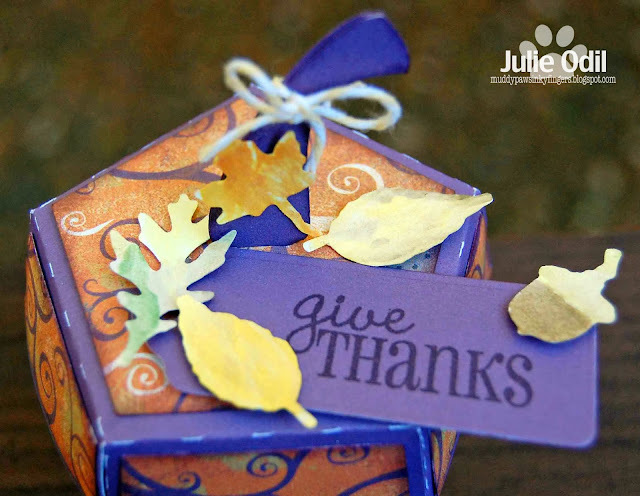 The leaves were cut out with a Tim Holtz die and painted with Creative Inspirations Paint. 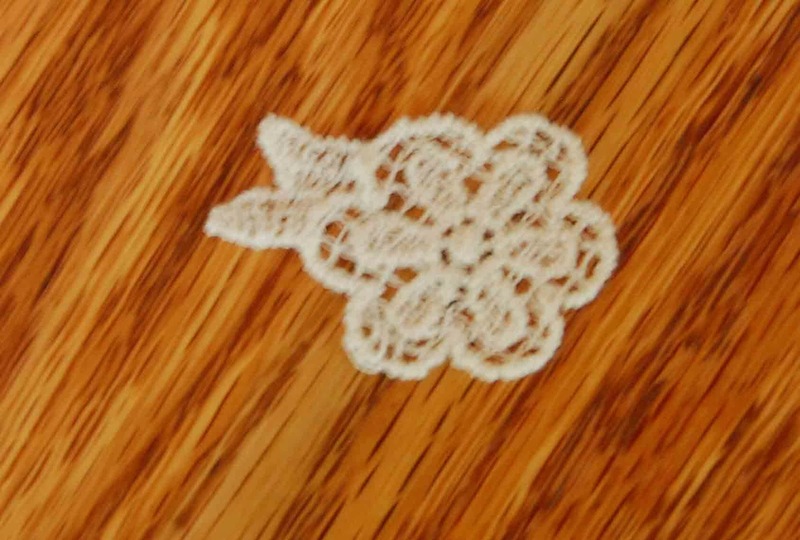 A piece of Trendy Twine in Totally White is tied in a bow on the stem. The tag shape was cut with a Spellbinders die. The papers are some retired Halloween papers from Close To My Heart. A Fun Friday, For Sure! Hello, blog friends. I'm having two great Fridays in a row. Last Friday, my husband's birthday, we were celebrating in a small town on Lake Superior. Today, I'm leaving shortly for a girl's weekend in the woods in Northern Wisconsin. My two BFF's and I have rented a house, signed our souls away so we can bring our dogs, and we're spending the weekend with just the 3 of us and our 4-legged friends. If the dogs do anything to the house, we may just as well buy the property for the size of the damage deposit we've put down! Time has been short this week, but I did manage one card with a Unity sentiment that I'm going to share with Friends With Flair. I found this adorable witch at the Silhouette Online Store here. As soon as I saw her, I knew what sentiment matched her perfectly. And, it's a Unity one, of course!! 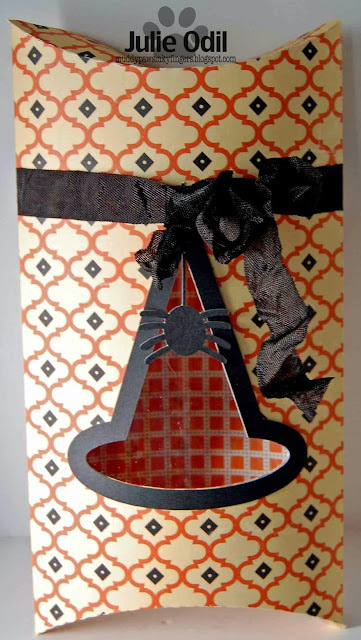 I used October Afternoon Witch Hazel 8x8 paper on the background of the card, a spider web embossing folder to emboss the oval, cut out with a Spellbinders die. The sentiment is part of a Unity Itty Bitty stamp called "You Witch!" The ribbon is from 3 Girl JAM. Both ribbons are from the Harvest Bundle. I will not have internet access again this weekend. Once again, I apologize for not visiting your blogs. Next week, I'll pay you a visit, I promise! I miss all the inspiration when I don't! I'm quite sure I've upset the farmers in my life with that title, but I really didn't mean to! It's actually in reference to my love of chocolate! This Halloween/Fall cutting file comes with a variety of windows to cut out. I really liked this leaf shape, feeling it matched my paper so well. I used an old piece of packaging for the window. Some Halloween Twine from Trendy Twine holds the tag on to the milk carton. The stamped image is a stamp set from Close to My Heart, with many chocolate-themed stamps in it -- very fun! Don't forget to visit The Cutting Cafe's blog on Thursday to see all the inspiration. Leave a comment for a chance to win 3 sets of your choice from The Cutting Café. Woohoo!!!!!!! Hello friends, I hope you enjoyed your weekend! My husband and I had a great time celebrating his birthday and exploring the south shores of Lake Superior. Or should I say, we had fun exploring in between rain and snow showers! Mother Nature wasn't 100% cooperative! I used one of my favorite stamp sets -- "It's All Fall Puns" Stamp Set. You can find it, and all of the wonderful Joy's Life stamps here, in the Joy's Life Store. The papers are from Close To My Heart. They are the Sarita 12x12 collection. The rhinestones are also from Close To My Heart. The ribbon is from 3 Girl JAM and is the London Blue from the Wine & Jewels bundle. I promised to announce the winner of the blog candy from the weekend's All Fall hop. Random.org chose commenter #10 (Teresa K): "This banner is just adorable! Wow, I am not sure I could pull an all nighter any more myself- but it sure did not affect your creativity! Great job! Teresa K" So, Teresa K, please get in touch with me so I can mail your blog candy off to you ASAP! Thanks! 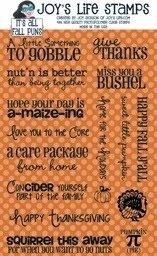 And, I hope you enjoyed today's sweet little card. Hurray! 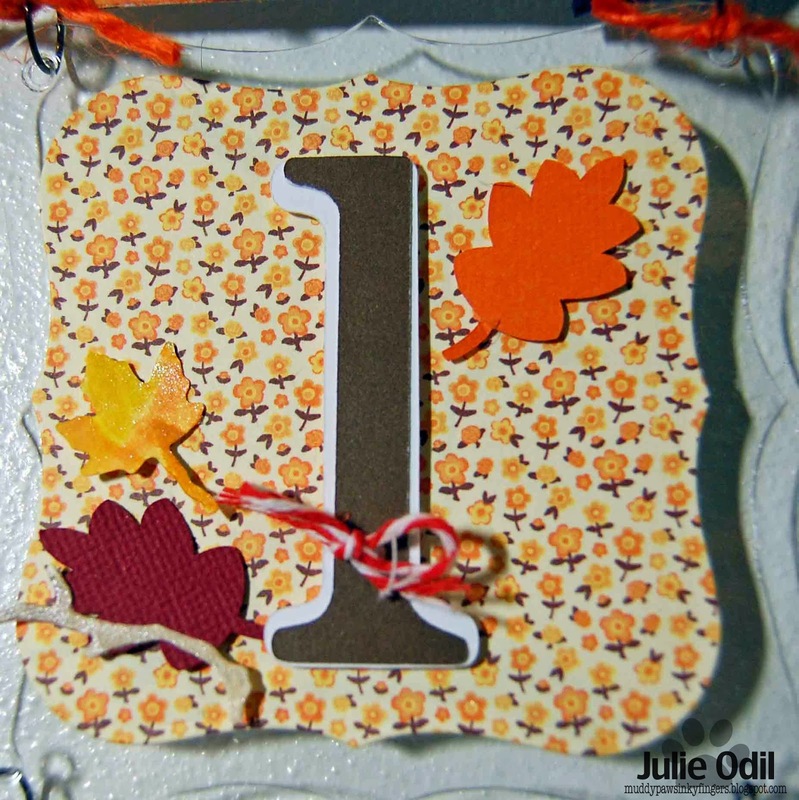 The All About Fall Blog Hop is finally here! 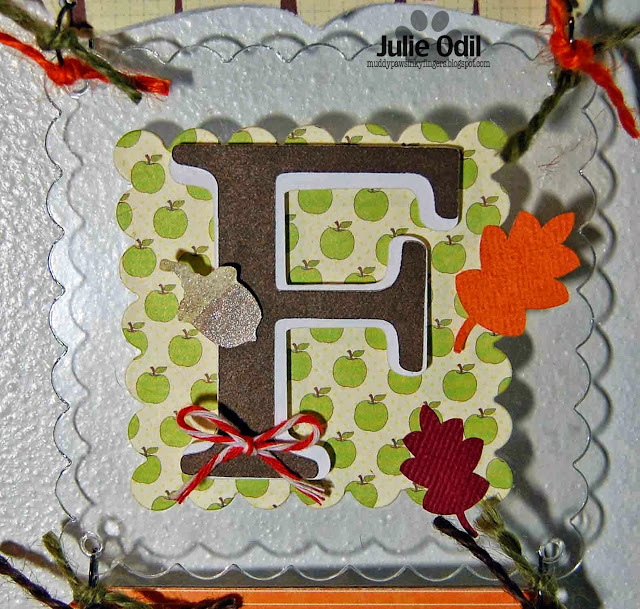 The entire talented Joy's Life design team is hopping today, sharing projects that are "All About Fall." There's a lot to see on this banner, so I have pictures of the individual panels. I'll tell you more of how I made it as I go along, too. First, a close up of the top square of the banner. Each of these 4x4 decorative squares is from a mini album that I took apart. Close To My Heart used to make them. They were called a Mix & Mingle album. I love them for banners because some of the panels are acrylic and some are chipboard -- perfect for something like this! 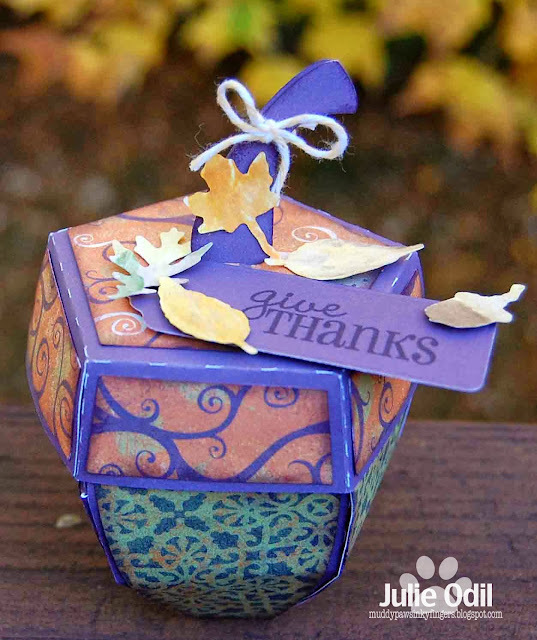 I used a stamp from the Joy's Life stamp set "It's All Fall Puns" on the first panel, the "Give Thanks" sentiment. The #4 and all the letters were cut out on my Cricut, using the Cricut Classic font cartridge. The designer papers are from the Jillibean Soup Apple Cheddar Soup 6x6 paper pad. The white and cocoa cardstock are from Close To My Heart. 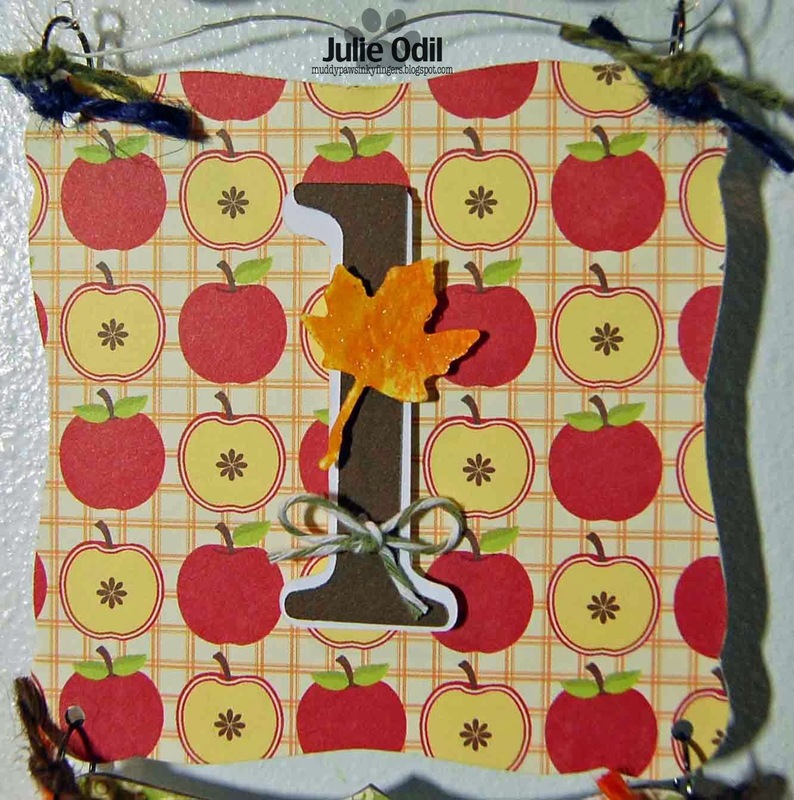 I used various Spellbinder dies to cut the shapes throughout the banner. 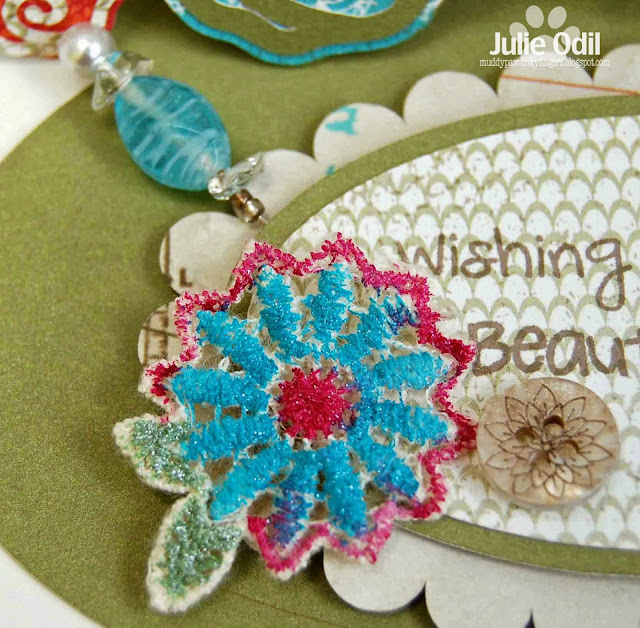 Here, you can see an acorn cut from a Tim Holtz die, painted with Creative Inspirations paint. 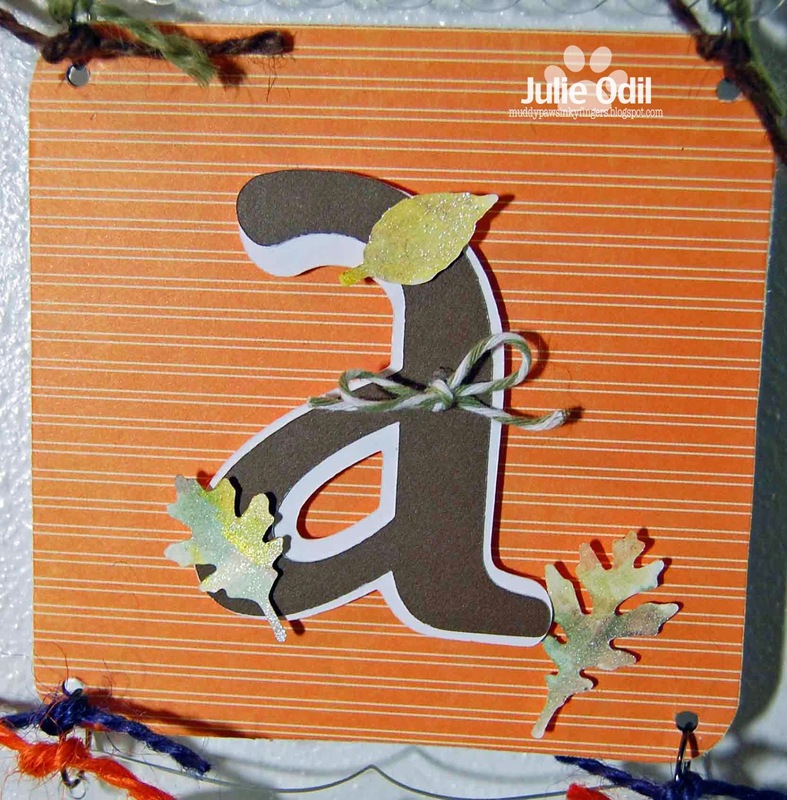 The leaves are from a cutting file from The Cutting Café using American Crafts Autumn cardstock. The twine is from Trendy Twine, and can you see that jute string on all 4 corners? That's the new jute string found in the 3 Girl JAM store. It worked perfectly on this banner because of the wonderful Fall colors. I used the Jute ribbon found in the 3 Girl JAM store at the top of the banner. the "a" is decorated with more leaves from the Tim Holtz die. They've all been painted with various Creative Inspirations paints. On this first "l", you can see another of the acrylic pieces that I used. 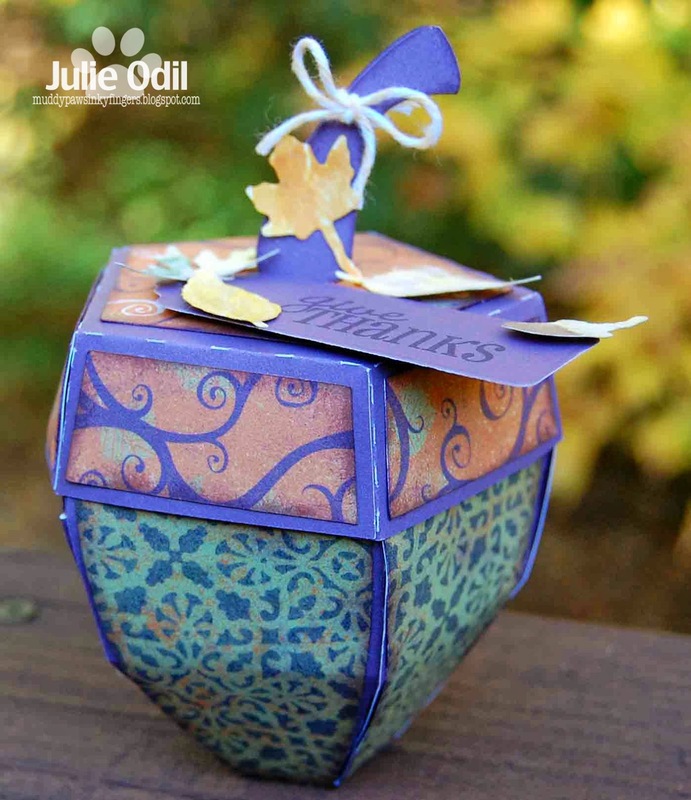 There's some more Trendy Twine here, too, along with leaves cut from The Cutting Cafe's file and the Tim Holtz die. This final "l" gives you a good look at the pretty jute string from 3 Girl JAM. At the bottom of my banner, I used another Joy's Life stamp, from the same stamp set -- It's All Fall Puns. That cute squirrel is cut from a die. I didn't use my electronic cutter during the stormy night, so I stuck to metal dies as much as possible. 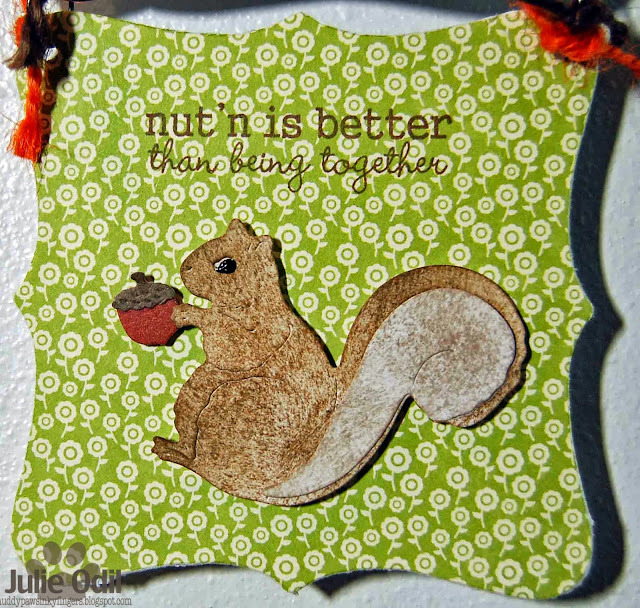 The Spellbinder ones were perfect for this project, as was this squirrel die from Cottage Cutz. I cut the squirrel out on white cardstock, but used TH distress inks to ink him up. The eye was made with a Viva Décor Pearl pen. I have one more view of the whole banner for you, since it was a few pictures back when you saw the whole thing. In honor of today's hop, and the fun I had making it (it's been years since I've pulled an all-nighter! ), I have some blog candy to give away. I have some stamps, a 6x6 paper pad, some embellishments, and brads. To be eligible to win, please follow my blog and leave a comment on this post. I'll pick the winner with my Joy's Life post on Monday. Now, off you go to the uber talented Dawn's blog. It's All Fall and all beautiful at http://dawnmercedes.blogspot.com. Off you go! Hello, and happy Friday! 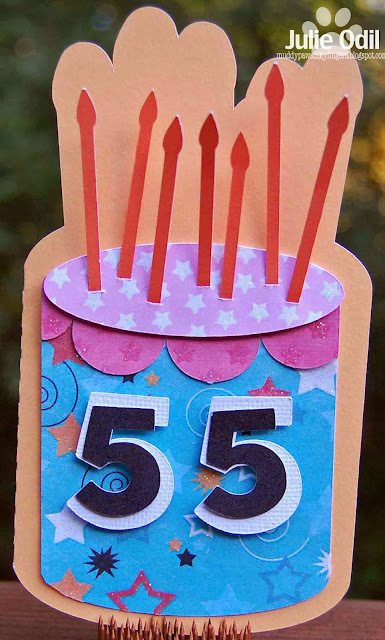 Today is my husband's 55th birthday. We met when he was 24 and suffering from a brain tumor. We started out our life together thinking life was precious and not knowing how many years we'd have together. We'll celebrate our 30th anniversary this December. We now know without a doubt life is a gift. So is love, and every day we have together! We're celebrating his birthday by getting out of Dodge. The dogs are being kenneled (something we never, ever do -- bad things happen when we kennel our dogs, but that's a story for another day), and we're heading North to Lake Superior. We're hoping for some nice weather to enjoy our favorite lake together (but the forecast is for 2 days of rain mixed with snow. Oh well!). We're taking today off of work to get an early start, making a 3-day weekend of it. Off we go on a little adventure, celebrating life and love! 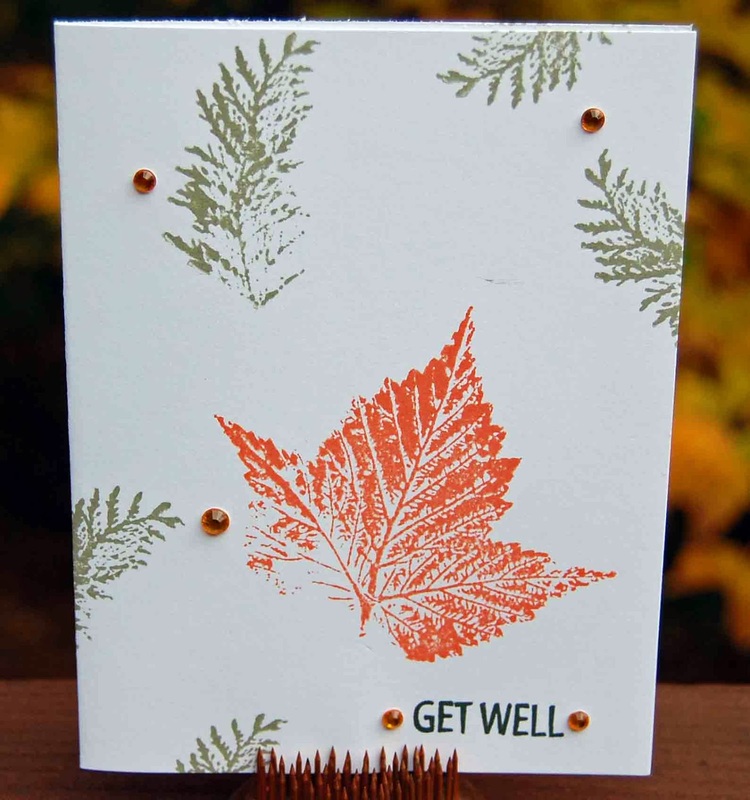 I used the Unity/Susan K. Weckesser Autumn Grunge stamps on this card, stamping the leaves randomly, and in different Fall colors. The sentiment is from Close To My Heart. I made another one almost identical to it. Those of you who know me, know I often make 2 cards the same. This one went to a co-worker recovering from carpal tunnel surgery. I added a little bling to this card, since it went to a "female" recipient. 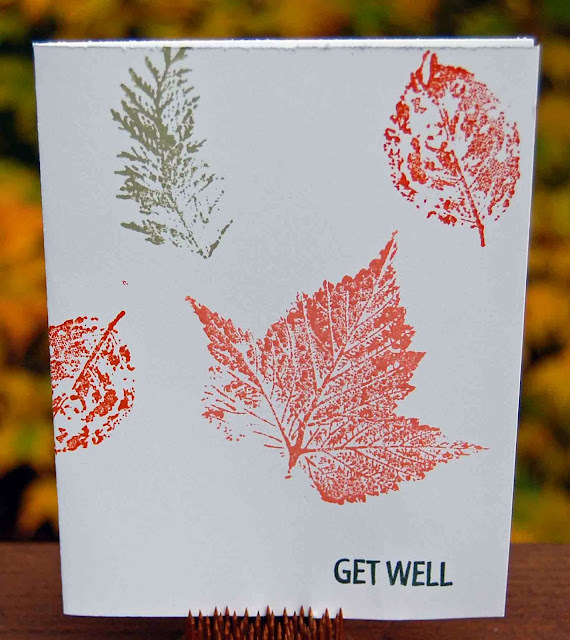 I was also liking the way the fern-like leaf stamped, so stuck primarily to that one on this card. I promised my husband this weekend is all about him. I don't know that I'll have a chance to visit all your blogs like I usually do, so forgive me if I skip a week. I also don't know if we'll have internet access where we're going. Hello, crafty friends! There's a new challenge starting today on the 3 Girl JAM challenge blog. Use anything Halloween, plus ribbon. I've been enjoying the witches hat shaped card file from The Cutting Café, so I decided to make another one of those for the challenge. Isn't it just the cutest? I love that sentiment! It's from the Joy's Life Halloween Puns Stamp Set, found in her store. The papers are some retired ones from Close To My Heart. The ribbon, is, of course, from 3 Girl JAM. I used both Harvest Orange (Harvest Bundle) and Tuxedo (Celebrations Bundle). The spider and bats are found in the Silhouette Online Store. I hope you enjoyed today's shaped card. 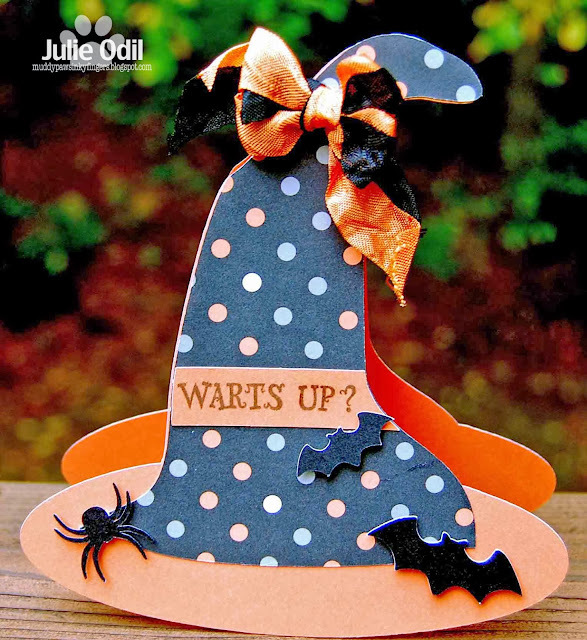 Make your own Halloween project, add some ribbon, and join the challenge at 3 Girl JAM Challenges. 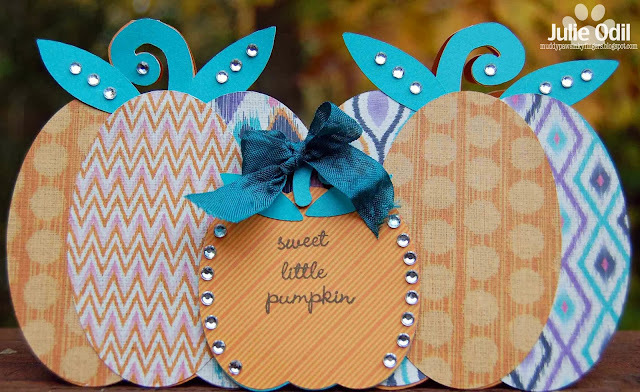 Hello, dear crafty friends! I have a post up today on the 3 Girl JAM blog. We're getting closer to Halloween, and I'm continuing to make cards to take to my nursing home friends. I have a super cute one to share with you today, sure to brighten someone's day! I used two ribbons from 3 Girl Jam on this card -- Harvest Orange, and Tuxedo. Harvest Orange is from the Harvest Bundle. Tuxedo can be found in the Celebrations Bundle. The Witches hat shaped card is a cut file from The Cutting Café. The bats and spider are from the Silhouette Online Store. 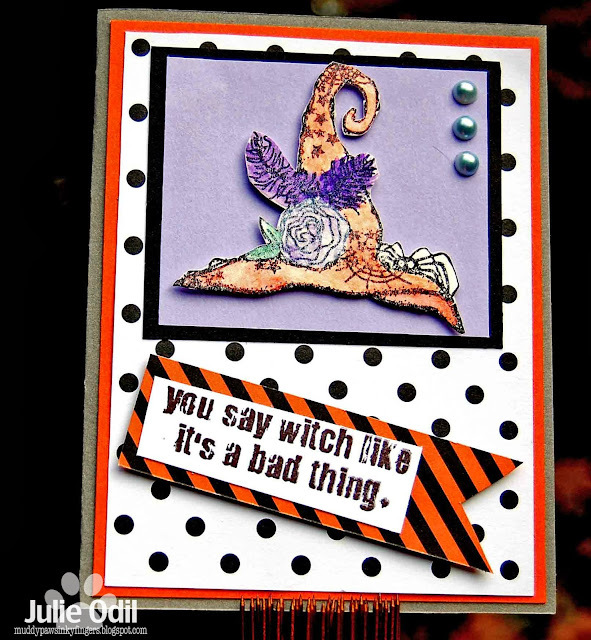 The sentiment is from the Joy's Life Halloween Pun Stamp Set, and can be found in her store. My husband turns 55 tomorrow. We're leaving town for the weekend, heading to Lake Superior, to one of our favorite towns, hoping to relax. I can't wait! It's time for a new challenge at Cameo Creations Challenges. For the next two weeks, it's anything candy. 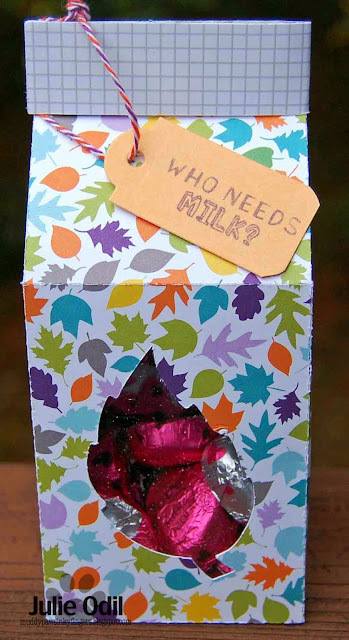 With Halloween just around the corner, I decided to make a container to hold some Halloween candy. I'll be ready with a little gift for a co-worker or friend! Kinda spooky isn't it? I cut this out on my Silhouette Cameo, using a cutting file from The Cutting Café. It's one of the Halloween Pillow Boxes, found here. 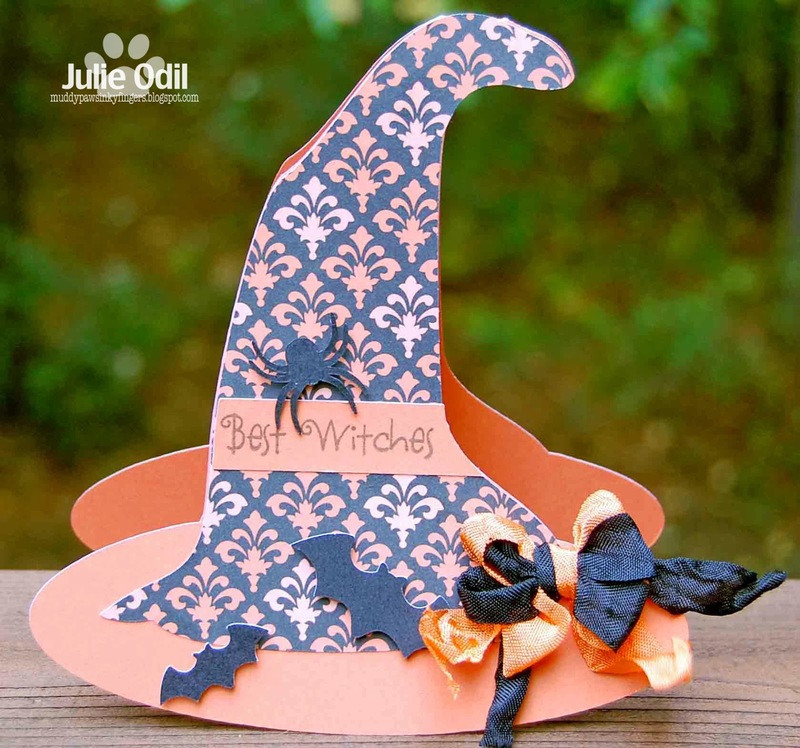 The paper is from Carta Bella All Hallow's Eve collection. I love those spiders on there! I used some old packaging for the window. The crinkle ribbon is from 3 Girl JAM. This week at The Cutting Café, we're making pillow boxes - any theme will do. Since we're getting closer and closer to Halloween, I went with a "spooky" theme. These pillow boxes that Regina has designed hold lots of goodies and go together very quickly! If you need a quick gift, these are perfect! The pillow box I used is part of the Halloween Pillow Box set, found here. I originally filled this with candy, but then changed my mind because I love how this looks with the double sided paper showing through. It also shows the spider off better. 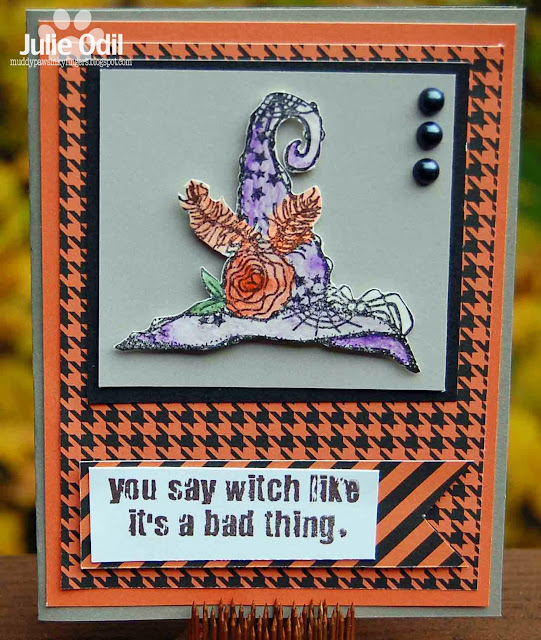 This paper is from October Afternoon (Witch Hazel 12x12 Collection). 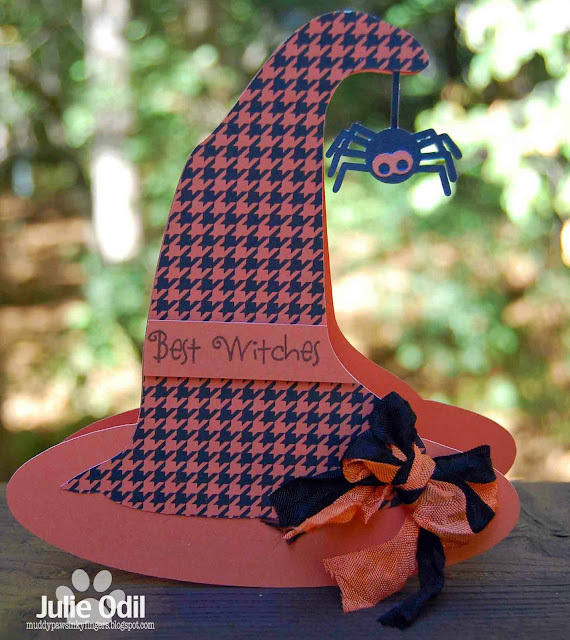 The spider was laying on my craft desk from another project and dangled perfectly on the witch hat. I believe it is from the Silhouette Online Store, but The Cutting Café has similar spider here, in the Halloween and Fall Basic Shapes Set. The crinkle ribbon is from 3 Girl JAM. There will be a great variety of pillow boxes shown from the other design team members this week. Make sure and visit the Cutting Cafe blog Thursday to see the whole collection. Leave a comment for a chance to win any 3 sets of your choice from The Cutting Café store. Wow! I give away many Halloween cards in the nursing home where I work, and I think someone will have a fun time getting this one! I stamped the ghost 3 times, fussy cutting each of them, then "strung" them from the Halloween twine clothesline. The ghosts and the wonderful sentiment, along with many, many more great images and sentiments, can be found on the Get Inky! Stamps "Halloween Spooktacular 2013" stamp set. Today is a very exciting day for me! It's my first day to post on the Creative Inspirations Paint blog as a design team member -- something I've dreamed about for a long time! I'm so excited about being on this team and having a chance to use these wonderful products! Let the fun begin! Even though it's October, I'm still seeing butterflies. I live in NW Wisconsin, and they need to be migrating or building their cacoons, but instead, they seem to be enjoying our mild weather. They were the inspiration behind today's project. I wanted to make something with fall colors, but using butterflies. I cut this easel card out on my Silhouette, using a file from My Scrap Chick, found here. The papers are from Close To My Heart, but are now retired (Stella paper pack). 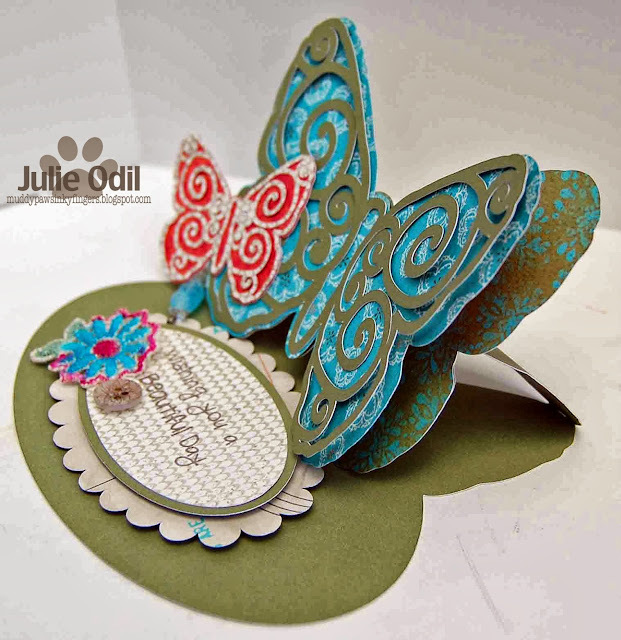 The sentiment is from Whimsical Designs stamp company. I painted the crocheted flower with fuchsia, Turquoise, and Sage Creative Inspirations Paint. 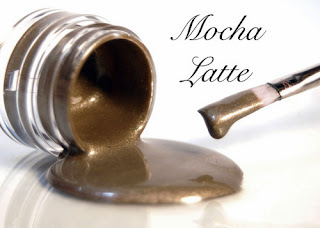 The button was white when I started, but I coated it with Mocha Latte Creative Inspirations Paint. I love how it brought out the texture in the button! That beautiful beaded stick pin is from Pinque Peacock, and can be found here. I'll leave you with another angle of the easel card, so you can see how the wings of the butterfly appear to be flying. their projects here on the blog soon?! To celebrate and waiting to see the new DT members reveals lets have a fun giveaway!! 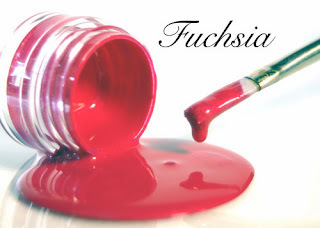 All you have to do is share on facebook and here on the blog your favorite CIP color! Every Sunday for the next 2 weeks we will be drawing names for 2 people to win their favorite CIP color! Each day you leave a comment on the blog or facebook one a day per person on facebook, blog or both your name will be entered into the drawing for each day! That means you have a chance for your name to be added 14 times for a chance to win, if you leave a comment each day on the blog and facebook! The 2-winners will be announced Sunday night 10pm CST! What's your #1 favorite Creative Inspirations Paint color?! I hope you enjoyed my first Creative Inspirations Paint project. I had so much fun creating it! It's a scary week this week with the Joy's Life design team. We're creating witches, ghosts, and monsters. Yeah, we're in full Halloween mode! I found an adorable witches hat card I wanted to try, and I'm pleased with how it turned out. What do you think? 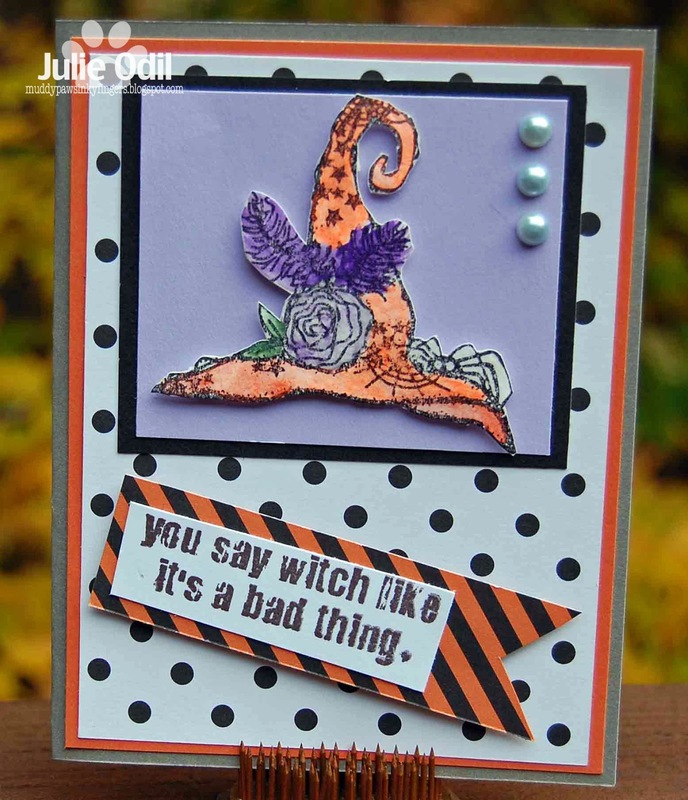 The sentiment is from the Joy's Life "Halloween Puns" stamp set. I cut the hat out on my Silhouette, using an SVG witch hat file from The Cutting Café. 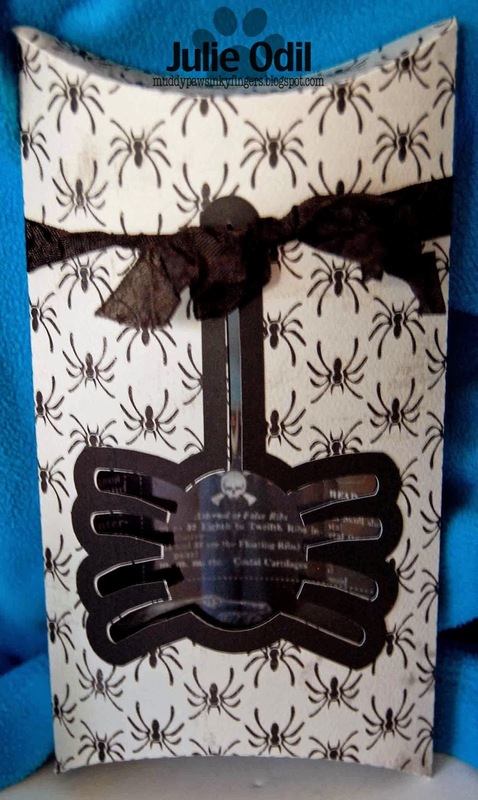 The spider is from The Silhouette Online Store. The woven bow is from 3 Girl JAM. I combined Harvest orange and Tuxedo black ribbons together to form the bow. Papers are all from Close To My Heart. I hope you enjoyed today's "scary" creation! It's Friday -- and that means Unity's "Friends With flair". This is my favorite post of the week. This is my time to make whatever I want -- no need to stick to an assignment or theme. I don't have to use a particular product or link to a certain company. All I have to do is ink up one (or more) of my favorite stamps and just have fun. Yeah. I love Fridays! I've had this little chipboard banner by Maya Road sitting on my work desk, left over from another project. It's been needing to go on "something". I saw a card at Simon Says Stamp, and inspiration struck! As is often the case with scraplifted ideas, I took an idea, ran with it, and made it my own. I used some orange Claudine Hellmuth Studio acrylic paint on the chipboard banner, then a small piece of paper from the Lawn Fawn "Into the Woods" 6x6 collection, tied with a little natural twine for the banner. There's some more "Into the Woods" paper down the side of the card. The stamped image and sentiment are from one of the first Stamp of the Week's last Fall called, "Nuts but I Love Ya". I stamped them both with Close To My Heart Cocoa ink. The sequins are also by Lawn Fawn. The woodgrain washi is from my stash. Can you see the pretty leaves in the background? That's my back yard. I LOVE this time of year! The fabric covered button, with candy corn print, is a 3/4 inch button. They are the perfect size for cards. L-O-V-E! The card was cut out on my Cricut. I made it big enough to fit into a business size envelope. I used a printable stamp from The Cutting Café for the focal piece. You can find it HERE. I didn't even have to color it! I just printed it, trimmed it, and voila! it was ready to go. Super simple! I added a couple of spooky glittery brackets from Making Memories, some Halloween twine from Trendy Twine, and the card is complete. Happy hump day, everyone! I had so much fun with today's card for The Cutting Café. I was in total Halloween mode on this one! 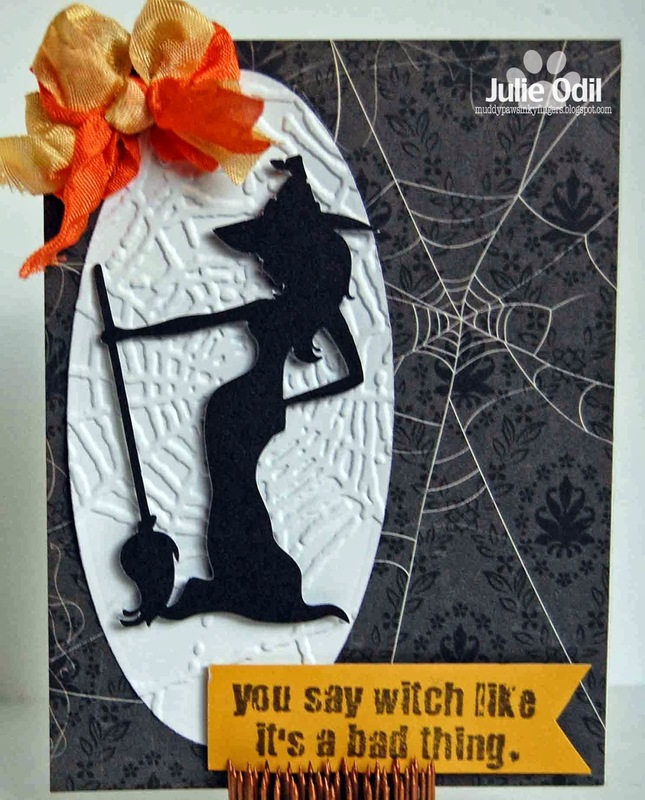 I give out lots of Halloween cards to my nursing home residents, and I think someone will enjoy getting this fun one! I used everything printable this week -- a first for me. I tend to lean toward the wonderful SVG files from The Cutting Café. This week, though, I wanted to challenge myself. 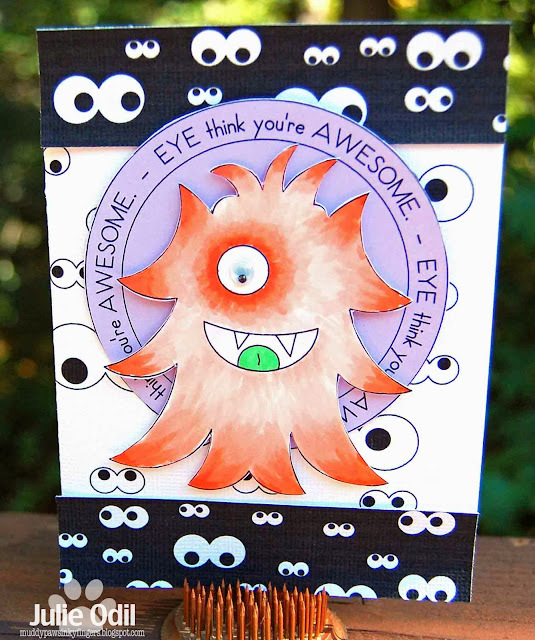 Here's everything I used on this card: Googly Eyes background stamp set (printed 2 different ways -- white eyes, then black with white eyes) and A Bunch of Monsters printable stamp set. I used one of the large monsters, and one of the large circles. I colored the monster with Copic markers. In real life, he's a pretty spooky orange color. Don't you love that green tongue? Silhouette Challenges -- Challenge # 6 -- Critters! That was the sequence my thoughts took when trying to figure out what project to make for this month's challenge at Silhouette Challenges. I did some snooping around, and found a really fun spider card at The Cutting Café. Aha! That would be fun, I thought to myself. Is a spider a critter? It is now! I made a couple of them because they looked so good together. They were, of course, cut with my Silhouette Cameo. The cutting file for these cute spiders can be found HERE. 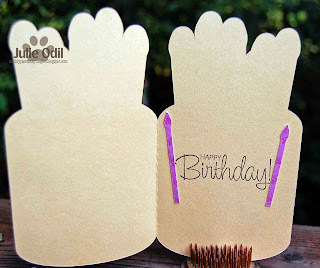 I hope you make your own critter project this month and enter in the challenge at Silhouette Challenges. You have until Oct. 31. Don't forget to check out the other inspiration from the design team. But don't get spooked! It's Friday, and it's Friends With Flair! It's Take Out Boxes at The Cutting Cafe!